Have you seen the articles in the news lately about people who are having their dried out, unsightly lawns painted to “green them up”? Apparently, there are companies that will come out and spray paint your grass for you. From what I have read, there isn’t anything environmentally unhealthy about the process. I think some of those claims are a little bit questionable. Like the fact that it says it will last up to 12 weeks OR UNTIL you mow. I don’t think many people who are concerned enough about how their lawn looks that they would have it painted would be willing to go for 12 weeks without mowing. And as far as reducing water and maintenance needs….does that just mean that you can go without watering and your grass will still look green……because it is painted? 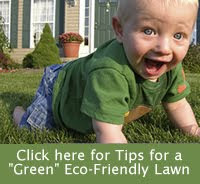 Although this isn’t something I would generally consider doing for my home lawn, there are a few instances where I can see using this process. My husband was lucky enough to participate in a homebuilding project for a national TV show at one time. They built a home quickly and then wanted to be able to showcase it on TV. One of the final steps for the production crew was spray painting the lawn so it looked green for it’s TV debut. I also think I might consider it if I was having an outdoor wedding (or other ceremony) on the grass at my own home or at a public garden somewhere. Wouldn’t a gorgeous green lawn just look better in the photos? Anyway, its just another one of those things that makes you say “Hmmmmmm.” Somebody had an idea and decided to make a business out of it. And with all of the press he’s getting for it lately, he’s probably bringing in as much “green” as he is spreading around.